Absurd, funny, tragic: an inside look at the lives and concerns of Russian writers, public figures, and just plain ordinary people in the Soviet period. Most of the vignettes are one, two, or three pages long; a few are longer. All are written in an easy conversational style. Most are wryly humorous, but some are tragic. Topics range from the absurdities of the Soviet economic system to the oddities and travails of cultural and scientific figures, from the difficulties of everyday life to the horrors visited upon innocent people. 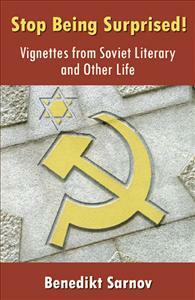 Sarnov is Jewish, and the consequences of being a Jew in the Soviet Union are a frequent subject.